I know that for some this is old news (by 3 years almost) but it still heartens me that corporate America is seeing the light. It may take, as in the case with Mark Bertolini, Aetna’s CEO, an almost fatal ski accident, to make these valuable changes. Or, we could possibly use these examples to guide our own actions in the world. Read on…..
And if you continue even further down, the Restorative poses from the Restore Series are posted as well as what Yoga Nidra is. Benefits: drains fluid from the legs, releases pelvic floor, chest and shoulder opener, back of legs get a gentle stretch. Place one bolster horizontally on mat (for the knees) and the two blocks next to bolster. Lay a blanket on top of the blocks.Recline legs over the bolster and lower the upper body on the blanket. Adjust so that the tips of the shoulder blades are right above the blanket. Add neck pillow under neck and move arms to Goddess position if comfortable for your shoulders. Otherwise, they can go by your side or stack hands on top of your belly. Cover pelvic area with a blanket. 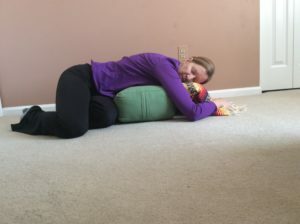 Use blankets, bolsters to support you and keep you comfortable for Yoga Nidra. Listen to Richard Miller in the recent Yoga Journal LiveMag segment Yoga Journal LiveMag – Yoga Nidra as he leads you through a session of Yoga Nidra (Yogic Sleep). He has developed a therapeutic mindfullness-based protocol called iRest or Integrative Restoration.